DARK ATTACK: HOBNOBBING WITH DEMONS AND DEVILS – OH, MY! What Is It Like for a Devil to Feel Its Heart? Between 10/22/2013 and 10/29/2013 there were 15 M-class solar flares and 4 X-class solar flare. During that time, it felt to me like there was a cumulative effect in Earth’s magnetosphere; a sort of rolling resonance, like a drum beat, that bestirred the entities of the astral plane as well as the minds and emotions of human beings on Earth. Something similar happened between 11/7/2013 and 11/23/2013: During that interval there were 10 M-class solar flares and 2 X-class solar flares, and one purportedly non-geoeffective solar filament that snapped. Demons Are Fallen Angels. Technically, as I understand it, demons are fallen angels (aka fallen angelics) such as Satan, Lucifer, Belial, Ba’al, Beelzebub, Leviathan, and so on. Very large, and very gnarly. Bigfoot Entities. There are also another sort of being sometimes termed a demon, a hairy, frightened being human-sized or smaller, that cowers in dark places in homes; I believe this is actually one of the types of bigfoot mentioned in “The Law of One,” possibly beings from Maldek … For more on these, see this ‘Maldek entities bigfoot’ search in “The Law of One: The Ra Material” … http://www.lawofone.info/results.php?q=Maldek+entities+bigfoot ..
Devils. Devils, on the other hand, are small, numerous, and very obnoxious. Dark Bodies of Humans (The Shadow of the Personality). The dark bodies of human beings are often mistaken for devils (and may have been so mistaken in the below account). Human dark bodies contain our repressed, socially unacceptable emotions, thoughts, and memories. Generally speaking, I find that devils can be distinguished from the dark bodies of our friends and associates by the fact that dark bodies are astrally ideated as being a dark version of our human, 3D bodies … perhaps only 4 feet in length, perhaps full size, whereas devils have no attachment to being human in size (see the subheading “Devils Can Appear to Be Very Big or Very Small” below). Bewitched Nature Spirits. Nature spirits, essentially joyful, carefree spirits that help physical Earth’s natural world to flourish, are sometimes bewitched by negative astral entities, especially in Earth’s large cities, where the devas that guard and guide the nature spirits cannot enter because of noxious astral pollution). Bewitched nature spirits can be mistaken for devils; but it is easy to tell the difference. Nature spirits will happily fly away if you say to them: You are free! Go where you will! Devils are not so obliging. 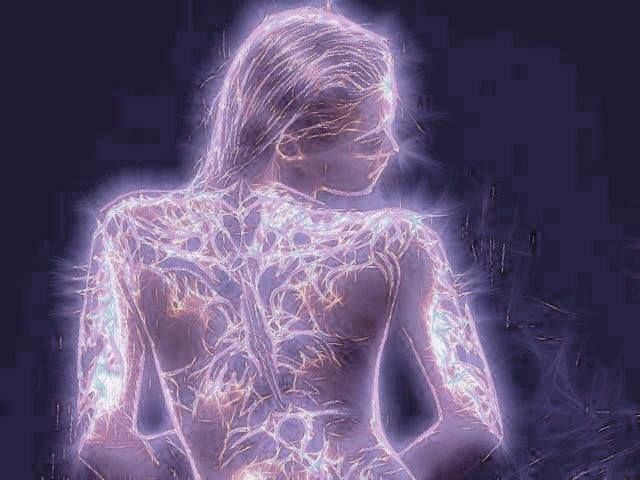 Image: Energy implants in a woman’s back: http://www.openhandweb.org/files/openhand/images/electric-body_0.jpg ..
See also: Link: “Understanding Energy Implants and how to remove them,” by Open , 28 November 2012: http://www.openhandweb.org/removing_energy_implants .. Both Daniella Breen … http://www.daniellabreen.com/ and youtube channel https://www.youtube.com/channel/UCiQ2Swm5SdbexxakECggaNQ … and I experienced this type of astral parasite, which was an inevitable hazard of the astral plane until the 2012 Shift, fall off us inert as we slept. This happened to both of us within a time span of a week or so; I forget what year that was, though I think it may have been in the early years just after the Shift. Possibly these entities are in the process of astral extinction because of the increasing levels of Light here on Earth. Here is for those little Dark fellows stuck in our astral fields … little occlusions where there is less Light, in the form of spirals, funnels, harnesses, bubbles, and so on. They can be very, very tiny, or rather medium-sized. They do not seem like it, but they are tiny entities. Some say ‘devils’. but that is a little harsh, from my viewpoint. Nope, I would not call them ‘good’ or ‘bad’. ‘Neutral’ describes it best. They have a carefree sense of humor, a great sense of play. They love pranking with humans. What gets us riled is this trait: They like the way pain sprongs about the human electric field … FASCINATING! and so, for them, tinkering with our electric field is like playing a banjo … the louder, and the more off-key, the more SPECTACULAR! To wake them up, try singing in the language of light, of spirit, very high and very clear, tone by tone, higher and higher, till you hear a tiny voice wake up and say: That’s me! Or you can try, in a very high voice: Rinky dink, Rinky dink, Rinky dink! Video: “Funny Face – ‘S Wonderful, by goldiesmusic, 5 June 2010 … http://www.youtube.com/watch?v=cputT1kKc9M .. But until we are clear of them, and after they wake up, you may notice that whatever your semi-subconscious or subconscious mind says, they will say the confusing opposite of. So arises dissention and weak-willed-ness in the human race. One of two twin flames (let’s call them Twin Flame 1) will say: I love you! So then, the devils will send this vibe over the astral cord: I hate you! And Twin Flame 2 will think: Owweee! O no! Twin Flame 1 hates me. So then their devils will send over the astral cord, to Twin Flame 1: I LOVE you. And Twin Flame 1 will ratchet up on the emotion: I LOOOOVVVE you. And Twin Flame 1’s demons will obnoxiously translate to Twin Flame 2: I HAAAATTTE you. And the emotions of confusion, anger, and hatred will ratchet up. Much to the devils’ delight and amusement. For them it is a game. Tons of fun. Like football! For us it is pain and suffering. And for our Universe, this game has been what has allowed us to remain in the 3D-4D hologram, and to add that unique and nearly impossibly antithetical experience to that of Christ Consciousness, the True Prime Directive of this Universe. They: What does that mean? Here’s another example, positing two friends, Joan and Michael (4). I will use names, because devils play fun games with the names of people. They have a mechanism … or maybe an ability or ‘power’ … by means of which they can speak in any voice (any energy signature) they want, just by declaring they will do so. … and the words that follow will appear to your subconscious mind to be spoken by your friend George. Or they might use the name of any person whose voice is known to you, or of a nonspecific threat energy, and the words that follow will appear to be the words of that person or energy. This immediately put me to sleep, as there is still unconsciousness in my body in the area of my second chakra. Of course, the destiny of my lower body is for all the cells to be upgraded to Christ consciousness. But at that moment, there were unconscious occlusions there … areas of unawareness. That os why I fell into an unaware state. The navel point is the seat of will power, and clearly, I can see there is work to be done there in clearing areas of unconscious energy. But ‘work’ is an elusive term. In 3D parlance, it can mean a lot of careful planning, a lot of time and effort, and the prospect of either success or, Heaven forfend, failure. But in 5D, the work can take place, literally, in the flash of an eye, with the help of our ascension teams. Third Eyepoint Angelic Recovery Play. To continue, then at my third eye-point, with a popping flash of light, like a little firecracker but brilliant white, one of my Angels woke me up! It was a little embarrassing … there I was, doubling up over and over again, experiencing a subconscious three-hand play, all in the twinkling of an eye, and popping back into awareness, grasping for straws of understanding! What is this all about? What is happening? As this happened again and again during group meditations, I eventually came to an initial understanding of what was going on. The devils were playing with my energy, the Angel was doing his oh so wonderful job, and my celestial ascension team was bringing me into the light of awareness. Joan: Michael Michael Michael Michael!!! Devils: Joan Joan Joan Joan!!!! Devils: …pause… What’s THAT mean? And now you have lulled their very clever, lighting quick minds just a tiny bit. Taken the edge off. There is a swirling, tinkling energy in their vicinity. They loved the game! It was confusing! Daring! Fabulous! That will allow them to further align with the light. And then their energy will begin to equalize, the gap between their 5th and 2nd chakras will begin to close, and they will begin to feel their hearts, most likely for the first time. If you feel your heart, dudes, the big B will eat you up! So natch, to feel their hearts will be EXTREME. And when this starts to happen, feel your deep inner heart. Feel it wide open, 3-4 inches diameter (or a little more, as needed). Remember that devils can be very, very big, or very very small. Same devil, though. So if they put on the old I’m an ELEPHANT … I am RODAN razzamatazz, you do not need to open your deep inner heart any larger than it already is. OK! THAT’S ALL FOR NOW! and they will dive right in. Long term, natch, the thing to do is to fill our aura, our homes, and all the Earth, the Solar System, the Galaxy, our Universe, with Light and love, through the blessing of Christ Consciousness. For myself, I would add to this upliftment list: Those beyond the Aldebaran Stargate! (1) NASA SWPC provides weekly reports on the NOAA’s National Centers for Environmental Information website … go to https://www.ngdc.noaa.gov/stp/spaceweather.html and then, under NOAA Space Weather Products, click on ‘Periodic Reports‘, then click on ‘ weekly_reports/ ‘, then click on ‘ PRFs_of_SGD/ ‘, then click on the year, and then on the month, then click on one of the weekly pdfs. Link: “Top 50 Solar Flares,” from SpaceWeatherLive … https://www.spaceweatherlive.com/en/solar-activity/top-50-solar-flares ..
Link: “Earth’s Magnetospheric Resonance and Cognitive Dissonance,” by Alice B. Clagett … http://wp.me/p2Rkym-7iB ..
Link: “Captain Kirk’s Five Favorite Weapons,” by James Hunt, 7 May 2009 … http://www.denofgeek.com/movies/21182/captain-kirks-five-favourite-weapons ..
(4) In clair speak, I find that ‘Michael’ is a name for Archangel Michael, one of my higher selves, and a very wonderful one indeed. ‘Mike’ is what the little demons use as as their names … a diminution meaning ‘little Michael’ or 3D-4D Earthly Michael; possibly a Fallen Angel fractal. Link: “Schadenfreude and the ‘Bow Down to Me’ 3-Part Football Play,” by Alice B. Clagett, revised; originally published on 13 November 2013 … http://wp.me/p2Rkym-7ia .. This entry was posted in 2nd chakra - sexual chakra - sacral chakra, 3rd chakra - navel point, 6th chakra - third-eye point, Anxiety - fear - panic attacks - fight or flight - cognitive dissonance - mental turmoil, Ascension team, Astrogeophysics - EMF - hologram, Dark Attacks, Demonic realm, Devas - nature spirits - nature elementals, Fallen angels, Higher Mental Body, Human hologram, Languages of light and sound, Lower Mental Body - gut brain (see also 'desire elementals' and 'lower triangle' and 'vital body'), Negative astral beings, Satan - Satanism, Shadow of our personality - dweller on the threshold, Solar events - geostorms, Unusual beings on Earth and tagged Aldebaran stargate, ascension team, astral entities, astral octopi, astral parasites, astrogeophysics, Ba'al, Beelzebub, Belial, Bigfoot, Dark Attack, dark body, DDD, Demon / Devil Directive, Demonic realm, demons, devils, fallen angel, Fallen Angel fractal, gut brain, Higher Mental Body, imp football plays, language of light, Leviathan, lower mental body, Lucifer, Mike, nature spirits, navel point, Negative astral beings, Satan, second chakra, sexual chakra, shadow of the personality, sixth chakra, solar flares, SPEs, star crew, suppressor parasite entities, third chakra, third eye-point, Unusual beings on Earth on 23 October 2013 by Alice B. Clagett.